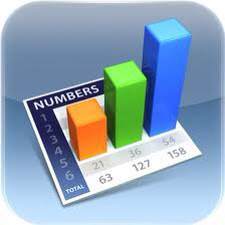 Note: I have written a second post on using Microsoft Excel templates with Numbers. 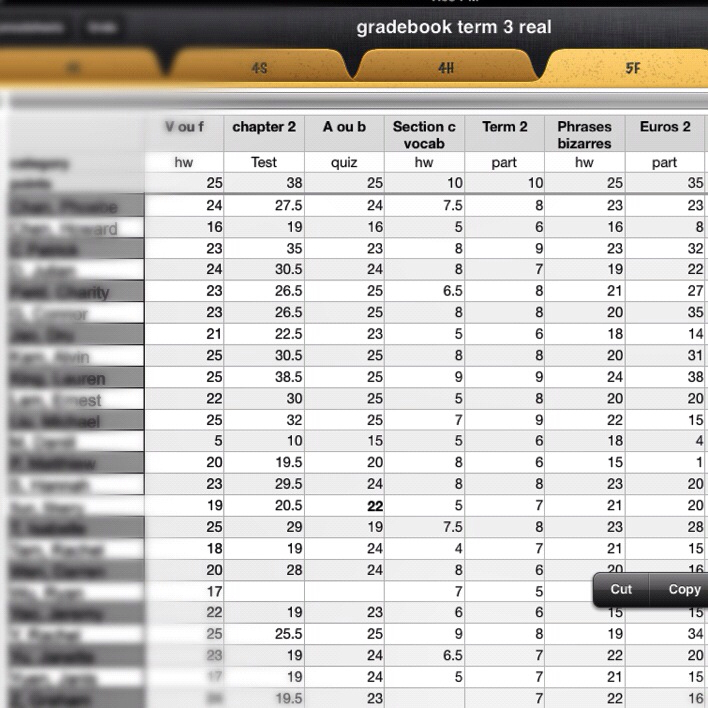 How Numbers for iPad can save you time and make life easier during report card time! Numbers (itunes link) spreadsheet app directly from Apple, is a worthy Microsoft Excel-like competitor for the iPad. It is a powerful tool for teachers who own an iPad, and can be used for assessment, especially during report card season. 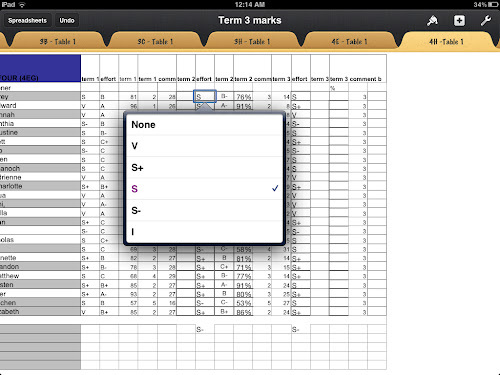 It is a $9.99 app that is part of Apple’s iWork suite which also includes Pages and Keynote. See the tabs near the top? 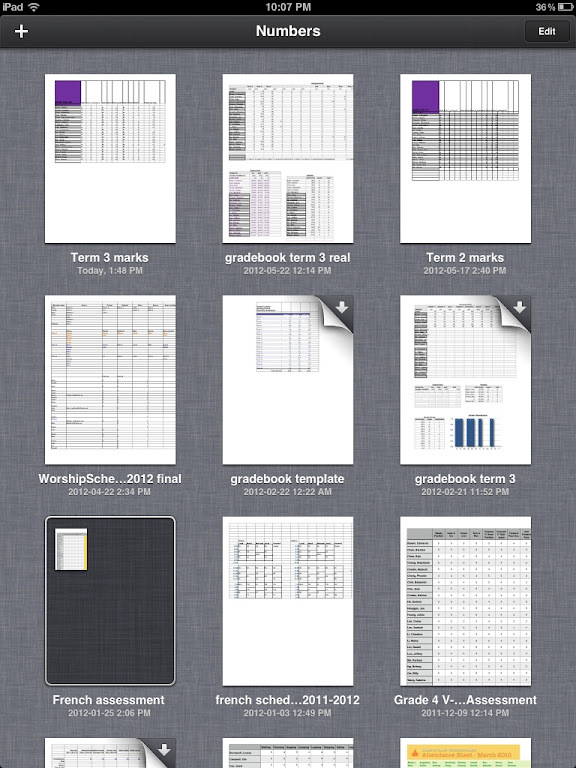 I simply can tap those to access any of my 14 classes. Here is a screenshot of how Numbers organizes my files. As you can see in the bottom left ofnit, I am able to create folders by dragging files into the box, not unlike dragging your apps into folders. Numbers is a universal app, meaning that you only have to purchase it once and you can sync all documents between all your iOS devices. Since I have an iPhone as well, I have instant access to everything within Numbers, including my students’ marks, grades, effort marks. If I need to quickly refer to something, I can access it within a few taps on the phone. I can make changes directly on the iPhone as well. as soon as I close the app on there, it will save automatically to the cloud, meaning that when I open up the document on my iPad, all changes are there. There is no need to press “save” or “save as…” and send it between devices. Everything is literally done for you once you close the app. How have I taken advantage of the iCloud feature? While I was out of the house one day last term, I received an email from one of my classroom teachers. She was wondering if I could verify a few marks and effort grades that I had sent her. I opened the file on my phone and made the necessary changes. All this was done while “on the road”. Also, when a student needs to be reminded of their mark, say on a recent quiz, it again only takes a few taps on either the iPad or iPhone to retrieve it. Just the fact that I am able to do my work whenever and wherever I want makes my transition from PC to iPad a no-brainer. For years, I dreaded sitting at the computer to input all my marks. It was something I put off until the last minute. Although in the end I was always happy to be completed, I just didn’t enjoy procrastinating. iCloud has made life much easier in this respect. Another great feature of Numbers is the drop-down menu. If I know I have a few options for the specific column, I can easily create them. 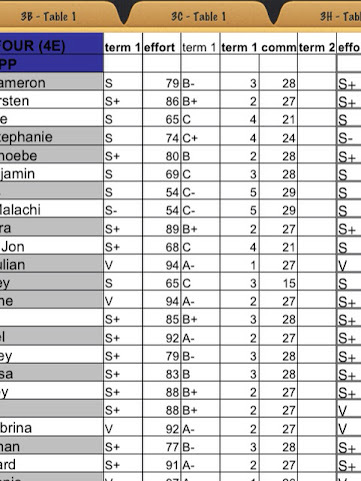 Once I create it for one cell, I can copy the entire column, and repeat for each class. Although most of you reading this probably won’t transition to this method this school year, I would definitely suggest exploring it for next year, especially if you already own an iPad. Remember that you can import all your previous Excel files and formulas! Bring your marking to the park, the beach, or just on your couch! Have any of you already tried using Numbers to do your report card marks? Let us know what you think of the process in the comments! 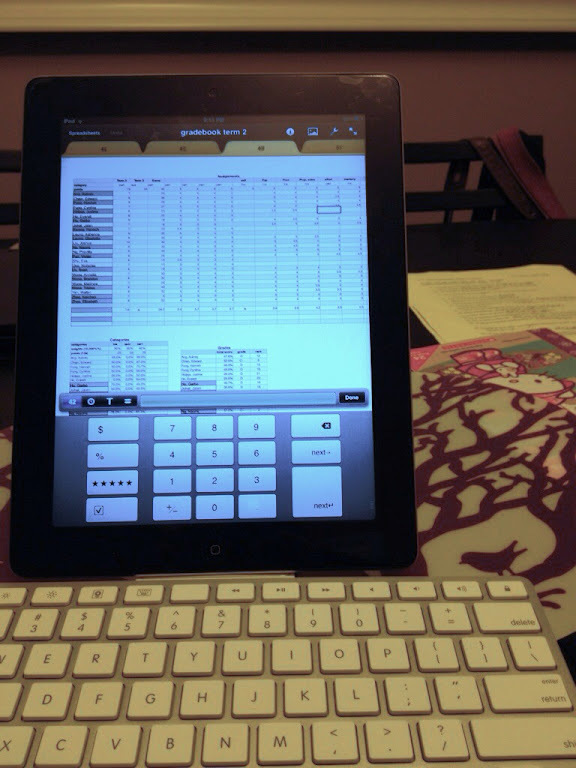 Next Post iPads can be used anywhere! I am interested in your gradebook! Would I be able to get a template?